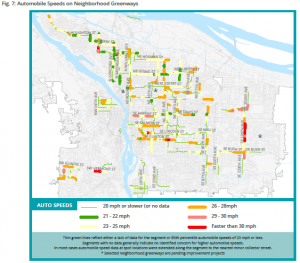 Earlier this week the City of Portland put out a report on their neighbourhood greenways (historically called neighbourhood bikeways), which like Vancouver, formed the backbone of their biking network for several decades. There has been a lot of talk in Portland about the frankly terrible conditions that some of the greenways have descended into: lots of fast moving cars making biking downright uncomfortable and dangerous. What makes the report interesting is that is the first that truly digs into the existing conditions and sets out clear targets for greenways, which have traditionally get a sign and not much else (as anybody riding on Vancouver St or Haultain in the City of Victoria can tell you). Looking at the report, I had a few thoughts about what it gets right and what could be improved. No other city that I know of has done a comprehensive look at their greenways/bikeways in this way, especially looking at motor vehicle volumes and speeds. Kudos to PBOT for taking this one. Bikeways were rebranded greenway to recognize that their role goes far beyond making biking more comfortable for the All-ages and Abilities crowd. Portland has been great about creating people-spaces along these greenways. Neighbourhood bikeways lack good design criteria. Unlike say, a bike lane, there isn’t a set of universally accepted standards. There were informal numbers, such as 1,000 cars per day, or 30 km/h, but until now nobody has truly coded that into their policy documents in such a strong way. This report lays it out in bold, clear terms, allowing staff, councils and advocates to start a conversation at the same place. Sorry PBOT, but “No Data” and “Meets the Standard” are completely different. No Data means just that; conflating it with areas that have been tested and meet the standard tells us nothing. 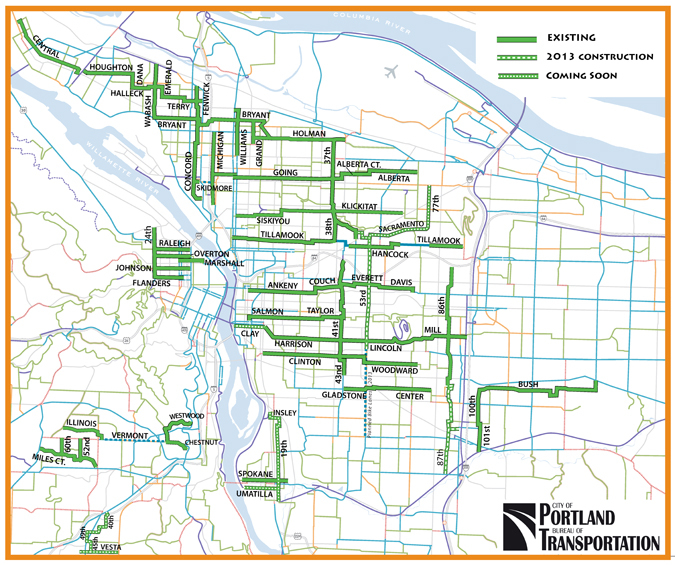 PBOT should reissue these maps clearly separating out No Data from Meets Standard. 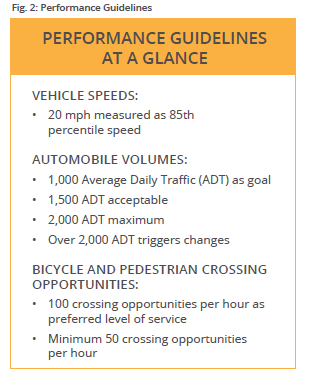 The report rather sets out 1,500 cars/day as the acceptable, but 2,000 as the maximum. But bizarrely, from 1,500 to 2,000 cars per day is unacceptable, yet action is only taken until the number passes 2,000. 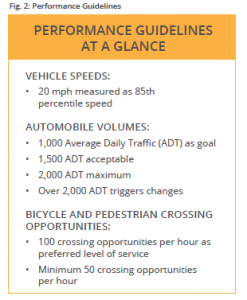 Given that traffic volumes can vary huge amounts per day (30%+), the threshold for action should be 1,500, not 2,000. 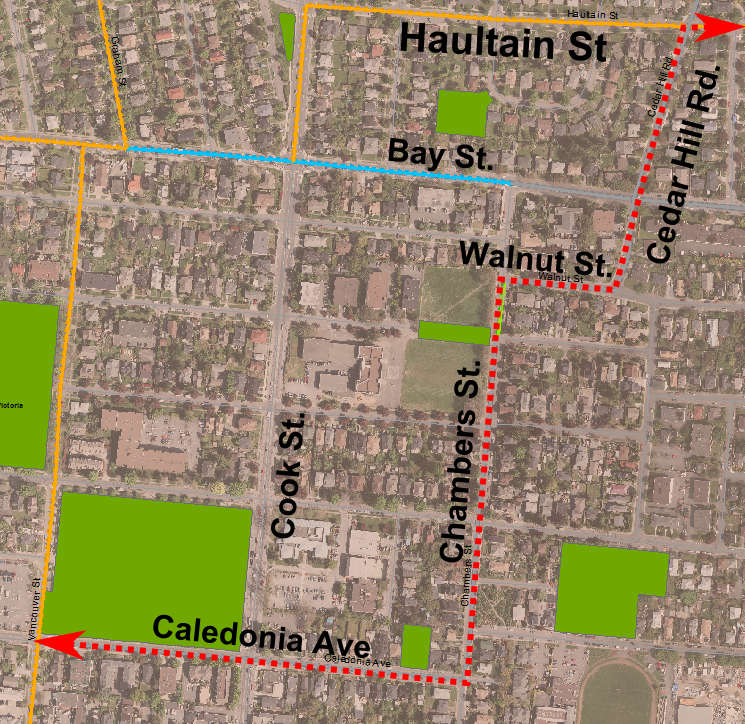 Beyond the Haultain bikeway: Cedar Hill Rd through to Vancouver St. Beyond the Haultain bikeway is the rest of my route to work, along the City’s of Victoria’s bikeways through to Vancouver St.
Like the other busy road without an barrier, Foul Bay Rd., Bay St. badly needs a barrier. There is enough road width and the hill just to the west makes the sightlines terrible here. along Walnut St. and Chambers St. These are nice quite residential roads with a few small pavement issues, so not much needs to be done here. I would mention that in the spirit of small details matter, I want to give a shoutout to the City of Victoria Engineering Department. They added small ramps at the northern end of Chambers St. where it is closed off to remove the bump that comes from crossing the two sidewalks. A nice little touch! on Caledonia from Cook St. to Chambers St.
Another place of truly terrible pavement. This stretch rivals Haultain St. in Oak Bay for sheer terribleness. on Caledonia from Cook St. to Vancouver St. 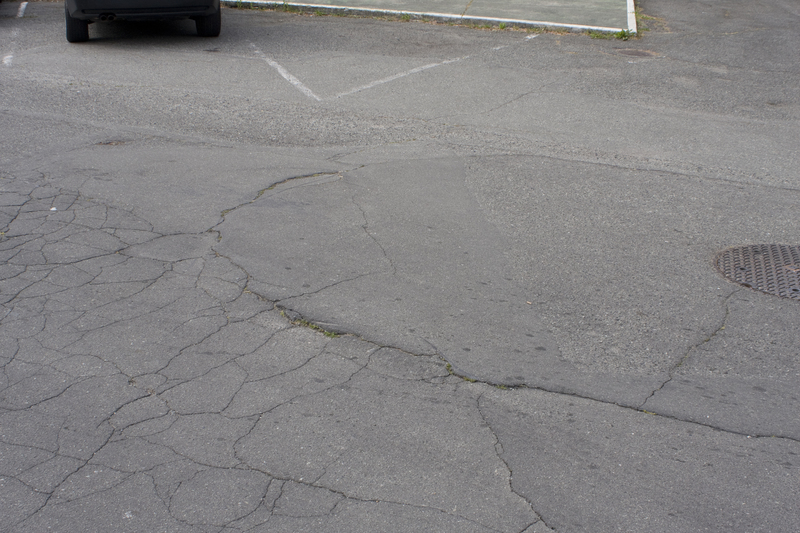 Given the City of Victoria is discussing a plaza on Vancouver St. beside Royal Athletic Park anyway, fully closing this intersection to all through motor vehicle traffic might just be the thing needed. A less radical solution would be close this intersection to east-bound traffic. 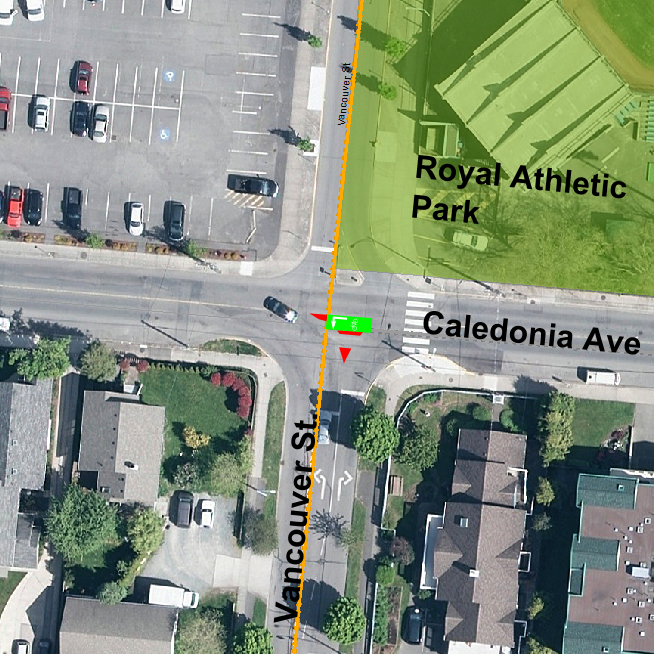 This would allow people to drive right up to the southern entrance of Royal Athletic Park but remove the commuting traffic onto other streets. There is one possible unintended consequence of this: increased motor vehicle traffic on Vancouver St. This would need to be carefully monitoring and mitigated for if it does appear. I plan on doing a similar set of posts for the Vancouver St. bikeway, so stay tuned! Posted on July 18, 2012 July 14, 2012 Categories BikingTags Haultain bikeway2 Comments on Beyond the Haultain bikeway: Cedar Hill Rd through to Vancouver St.
Today we deal with the section fully within the City of Victoria. There are two distinct pieces to this section. The first runs from Richmond to Shelbourne and is typified by narrow roadway with diverters at either end and very low traffic volume. The section further west from Shelbourne is quite different. The roadway is wider, there is a bus route running down this section (Route 22), there is more vehicle traffic and in the middle, Haultain Corners, a commercial village. The through bicycle traffic here is rising and the barrier is just too narrow here. It only allows a single bike through in either direction and badly needs to be widened to allow a second crossing space. 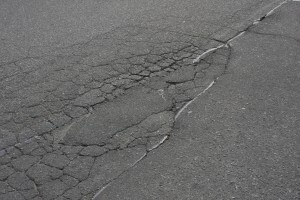 The major challenge is lack of road space to widen it properly. Like the barrier at Richmond, this one is just too narrow for the peak hour bicycle traffic through it. A third opening through it would make a big difference (especially as cyclists have very different travel speeds). This is a busy four-way stop with a fair amount of traffic in both directions, which makes it hard to do anything. This is the least pleasant part of the whole trip (save the crossing) because of the higher number of cars and occasional bus. There isn’t much that could be done here due to the space rquirmenets of trucks and buses. Sharrows might help, but research on them has shown them to be mixed and most of the time there are at least two or three cyclists on the road already. Within the scope of the Bicycle Strategy it is not possible to identify appropriate crossing treatments for specific locations — selection of crossing treatments will be undertaken at a later date, by the CRD and municipalities, in consultation with cyclists and other stakeholders. To the best of my knowledge, this has never been undertaken. Where Government merges into Douglas (Google Streetview link). Biking to work on Friday morning I saw a cop car with a non-cop bike in the trunk and an officer with an accident kit talking with somebody. I immediately knew that something had happened, but wasn’t sure what until the Oak Bay News article. Unclear exactly who is at fault yet, but the article does imply that the driver backed into the path of the cyclist. Given I am busy talking about the Haultain bikeway, this is sort of timely (in a potentially-tragic way). After a short mistaken detour yesterday to the section further west, today we head east and let’s look at its easternmost section (actually Estevan Avenue). A horrible 5-way intersection, there isn’t much that can be done here save a very expensive traffic circle which would seriously cut apart Lokier Gardens (the park at the intersection) which is actually heritage designated by Oak Bay. A slightly easier intersection. There is a fair amount of traffic on Cadboro Bay Rd and it might be possible to add an intersection barrier, although the challenge is narrow road width on Cadboro Bay Rd. A very easy intersection. The large traffic island with the oblique angle make this an easy conversion to a traffic circle. After the introduction yesterday, today we deal with Eastdowne Rd. and the start of Haultain St itself (at least through Oak Bay and Saanich). One of the major challenges with any sort of planning in the CRD is the sheer number of municipalities involved. It can be a good thing (can you imagine if Oak Bay-style stalling on bicycle infrastructure had been the policy across the region?) but sometimes it makes it challenging. This section is amongst the easiest in the whole piece. Like the more northern Estevan intersection, adding a traffic circle here would calm traffic as can be seen in the picture below, there is plenty of space here. 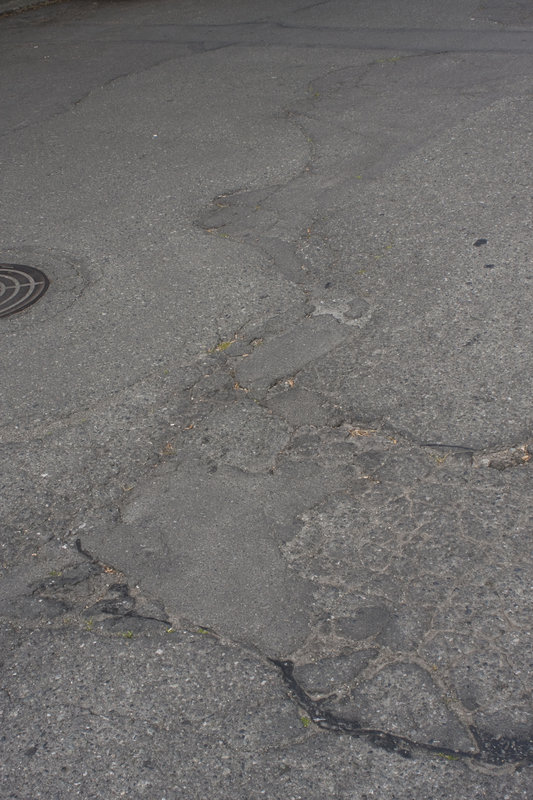 This part of Haultain needs to be repaved. Very badly. 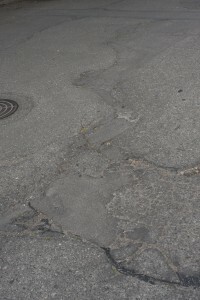 It is amongst the worst pavement I have been in the CRD. 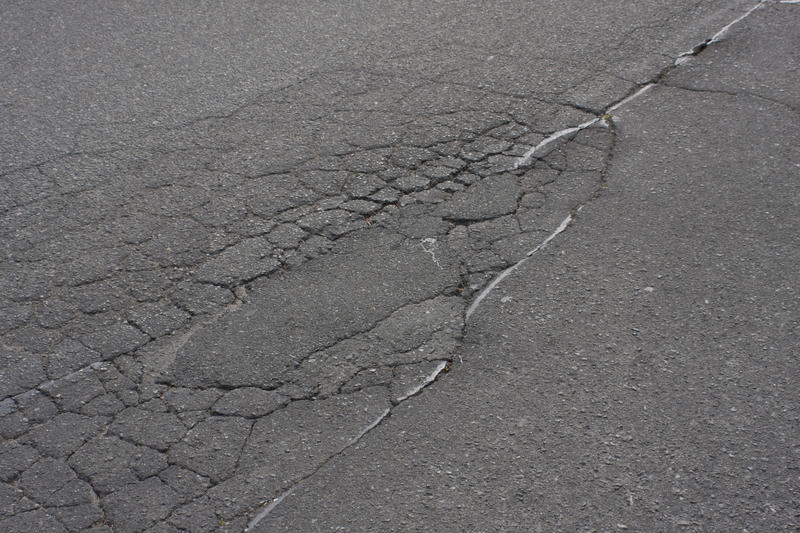 It is nearing the quality of pavement I have seen in places that much poorer than us (New Orleans after Katrina comes to mind). This is the toughest crossing of the whole bikeway. This is a very high traffic street that is quite wide. Unlike the two Shelbourne and Richmond to the west, there is no intersection barrier to prevent through motor vehicle traffic. It badly needs it. Haultain at Foul Bay. Green lines show bike lane realignment and green arrows show allowed motor vehicle left turns. There are some unanswered questions about these kinds of barriers. As they divert traffic, a small amount of additional traffic on Foul Bay would be expected. Doing a full intersection movement count would give Saanich and Oak Bay’s public works/engineering departments the information about just how many cars would be diverted. My guess would be a fairly low number due to the existing diverters at Richmond and Shelbourne. As we have now passed a slightly wet June and the weather is getting better, I thought now would be a great time to share some ideas about improving the cycling infrastructure in Greater Victoria. Let’s start with my ride to work: the Haultain bikeway. This is already one of the best east – west connectors in the core but it needs some work to make it great. Flat – unlike Fort to the south and other roads to the north, Haultain is largely flat. 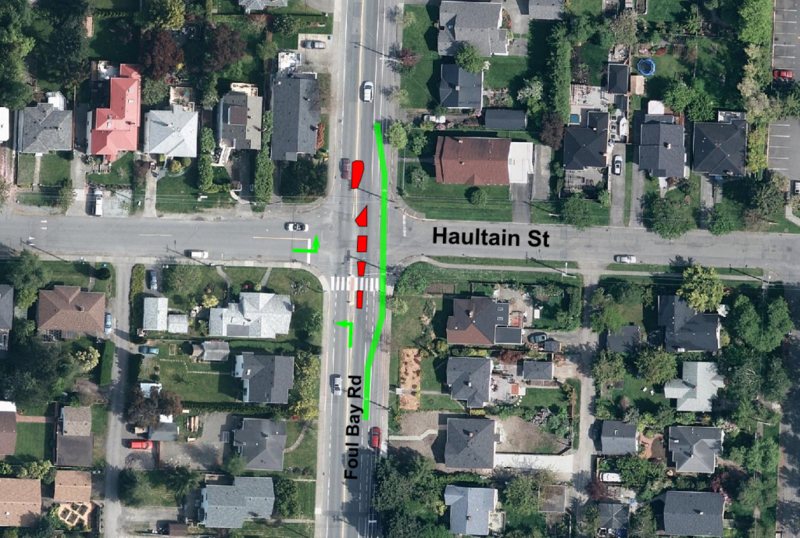 Already traffic-calmed – Saanich and the City of Victoria have already spent money and effort making Haultain pleasant for cyclists through closing off intersections and adding speed humps. Existing connections – it already links many other regional bikeways including the Seaside Touring route, Dean Ave, and via Cedar Hill/Walnut/Chambers/Caledonia gets you to Vancouver St. So if it’s so great, what needs to be done? None of the three (Oak Bay, Saanich or the City of VIctoria) jurisdictions that Haultain cross designate it was a bike way. It is identified as a route in the Oak Bay Active Transportation Strategy (an unofficial plan) and the it is part of the CRD’s PCMP Primary Inter-Community Network, largely because those of us who helped craft that document insisted on it. To say that the road here is terrible is an understatement. Unlike sections further west, there has been no recent paving here. This intersection needs a barrier like the intersections at Richmond and Shelbourne. Neither of these intersections are wide enough for the volume of traffic through them. This section can have fast moving vehicles, but adding traffic calming is impossible unless BC Transit removes the 22, something they are already talking about doing. 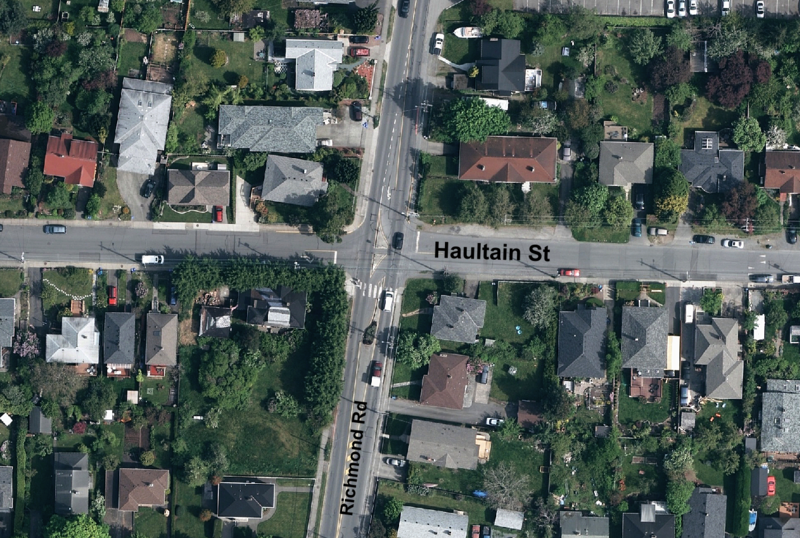 Haultain’s biggest problem is this lack of link. Although such a link exists via Cedar Hill and Walnut St in the official City of Victoria bicycle plan, but nothing actually exists on the ground. Over the next few days I will be sharing a section by section view of the bikeway with specific recommendations on how to make it better.